Started by two friends, Drink, Shop & Do started life as a pop-up shop and was so successful that it’s now open permanently. Set inside an old Victorian bathhouse, Drink, Shop & Do comprises of 2 separate rooms joined by a staircase. The first room, which you enter from the street, is a shop selling the kind of kitchsy goodies that we all have too much off but still can’t resist buying: cute mugs, adorable earrings and silly badges. 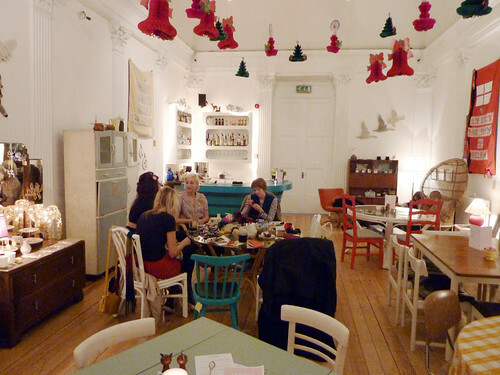 The second part of the shop is the cafe/bar of dreams containing such delights as tealights, floral fabrics, scotch eggs and cocktails…. And if you’re not a fan of a scotch egg, there’s so much more on offer. Stew of the day (screw soup of the day!! ), quiche, sandwiches and an intimidating selection of cakes. No cup cakes here, instead huge slices of classics such as Victoria sponge and Bakewell tart. And being licenced means that Drink, Shop & Do also offer beer, wine and cocktails along with the usual range of teas and coffees. But be warned that the staff aren’t stingy with their wine measures. 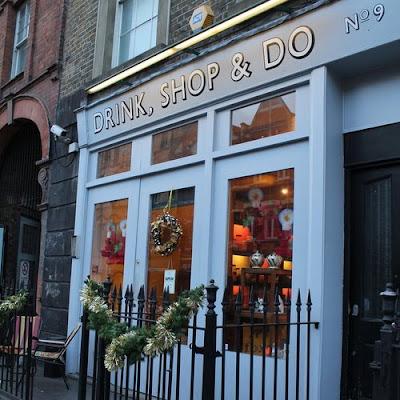 The ‘Do’ part of Drink, Shop & Do is a range of activities such as comedy nights, gingerbread decorating and scarf knitting which are on most nights of the week to try and keep you out of trouble. Scrabble Sundays are going to be a firm Cellardoor favourite. Although we’re not promising a high score once after a few huge glasses of the house red.